Forms water-resistant tubes around your lashes - Is not an oil-based paint - Cannot clump, flake, run or smudge - Adds volume and length - Fewer ingredients makes it lighter on lashes - Does not penetrate skin or lashes - Lasts longer without drying out in the bottle - Stays on when sweating, crying or rubbing your eyes - Leaves no tint or residue build up on lashes - Ideal for sensitive eyes and contact lens wearers - Does not require rubbing or makeup removers - Does not come off with oily skin - Tubes slide off lashes upon removal. The proof of the pudding is in the eating so they say! So it had a test run on my try as I have not found a Mascara to date that will keep lashes on. Blinc Kiss Me Mascara apparent success is forming "Tubes" around the lashes instead of painting them, this supposedly stops them from running, smudging, clumping, or flaking. This review has been based on a two-week usage to give it a full and proper test run. Because the formula in Blinc Kiss Me Mascara is not oil based, the application is a little different. Do NOT let the Blinc Mascara dry between coats, build the Blinc Mascara up to your desired lash length and volume before letting it dry. Blinc Kiss Me Mascara takes minutes to dry, so try to avoid blinking for a short while or you will smudge it (the only time you will be able to smudge it though!) and Viola - You have tubed your lashes, and what's more they look fuller and have a healthy shine. The first day in the two week trial is a Sunday in June (play day with the kids). Blinc Kiss Me Mascara does not claim to be waterproof, just water resistant, but a thought of a trial run in the swimming pool could not be missed to test it's water resistance. The result? Well its not surprising that the face was full of tubes soon after being dunked by the Husband (little git) so waterproof it is not (water resistant test later). After changing from my swim a fresh application was applied. Avoid using an oil-based cleanser beforehand. It was a nice summers day out, about 27°C (80°F) so perfect conditions to check this formula that incorporates Sunscreen. It is also suitable for contact lens wearers and sensitive eyes, My contacts were in so I was ready to go. The remainder of the day was spent shopping and then to the in-laws to take the kids to the park, and then home. Looking in the mirror later on (Blinc Mascara had been on for approx 9 hours) and nothing! That's right nothing happened, Blinc Kiss Me Mascara had stayed where It was applied - on the lashes, it had well and truly lasted the day and passed with flying colours. The day ended with a shower and this Mascara had stayed put, just don't rub your eyes after getting them wet and you will be fine. After the first day I was suitably impressed that it had done what it said on the tin. Monday was a typical workday, with one exception. there was no need to apply any more Mascara at lunchtime. 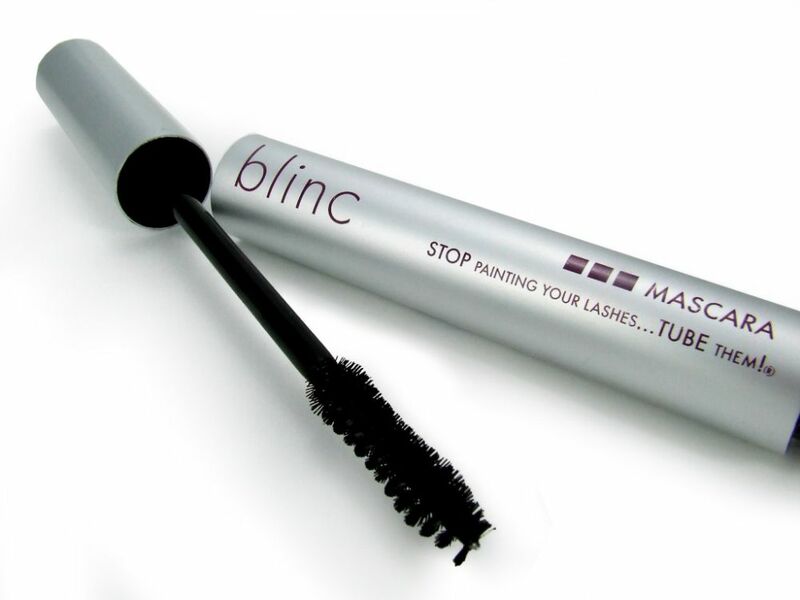 To remove Blinc Kiss Me Mascara in the evening all that was needed is some warm water and your fingertips. Splash your eyes with warm water and gently rub your lashes between your gingers and those water resistant tubes will just come off in your hand. The rest of the week went by with pretty much of the same routine till Friday. A office leaving party, so naturally us girls went to doll ourselves up before heading out, the only thing that did not need a touch up was the Blinc kiss me mascara. An evening in a restaurant and a night in the clubs and it was still going strong, no touch-ups required. Needless to say it was a very early morning getting home and a little worse for ware, as you can imagine I went to bed in full war paint. Woke up in the morning and aside from having a stinking headache the Kiss Me Mascara had stayed firm - no panda eyes, shame about the rest of the make up though! Very messy. Had the normal weekend routine with the same performance from the Blinc Mascara as the last weekend, the rest of the week was nothing out of the ordinary either, till Thursday. Was feeling a little under the weather Wednesday night and woke up to a full-blown cold Thursday morning, soldiering on though the workday though had a surprising result! The Blinc Kiss Me Mascara had smudged! Thinking back on it I may of got a little harsh and frequent with rubbing my eyes, the result was smudging, nothing major but it was in need of a touch up. My final thoughts on the Blinc Kiss Me Mascara is it ticks all the right boxes, it may not be waterproof but who need waterproof when this water resistant beats them all hands down on a day to day basis. Blinc Kiss Me Mascara has proved that it is great lasting mascara that has the ability of lasting all day and night. The only limitation as far as I can see is that it is not waterproof, but in reality what mascara is truly waterproof? And why do you need a waterproof mascara when a water resistant mascara will do much more, while still being easy and quick to remove. This Blinc Kiss Me Mascara is a must for any make up bag.